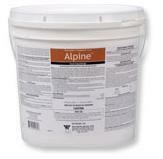 PRODUCT DESCRIPTION: Alpine dust insecticide is the industry’s first and only Reduced Risk* non repellent dust for long-lasting, broad-spectrum control of crawling and flying insects. # Broad use label for inside and outside non-food handling areas. # Broad spectrum label for use on: ants, centipedes, cockroaches, millipedes, spiders, silverfish and other crawling insects. # Doesn’t excite stinging insects. # Controls pyrethroid-resistant bed bugs. # Long-lasting non-pyrethroid control of ants. # Lightweight for better coverage and more applications per pound than leading dust. WHERE TO USE IT: Apartments, Campgrounds, Homes, Hospitals*, Hotels, Motels, Nursing Homes*, Office Buildings, Resorts, Schools**, Supermarkets, Transportation Equipment (Buses, Boats, Ships, Trains, Trucks, and Planes), Utilities, Warehouses and other Commercial and Industrial Buildings Do not use in food handling areas. * Remove patients before using. After treatment, ventilate rooms for 30 min before returning patients to rooms. ** Do not apply to classrooms when in use. Do not apply to institutions (including libraries, sport facilities, etc.) in the immediate area when occupants are present. In the home, all food processing surfaces and utensils in the treatment area must be covered during treatment or thoroughly washed before use. Cover or remove exposed food in the treatment area. Do not apply in aircraft cabins.